Remember "the good 'ole days"? These are "the good old days" and your feet will thank you ten fold when you wear your Ohio State, Retro-Tube knee -high length Socks. The only thing "Retro" about these socks however is the signature double rings around the top. 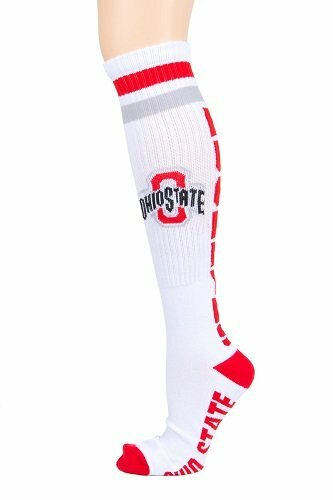 From the bold mid shin NCAA officially licensed logos to the extra padding on the bottom of your foot, to the Jacquard woven design of additional Buckeye logos on the arch, the alternate team colors complete to knee high Tube Sock you'll come to love. Durable, yet remarkably soft, warm and comfortable. Donegal Bay completes your sock drawer with these Retro-Tube/Knee-high length Socks.